Sometimes referred to as Smugglers’ Cove, Navagio Beach is one of the most popular attractions in Greece, with crystal-clear waters and the shipwreck of a notorious Greek smuggler ship. 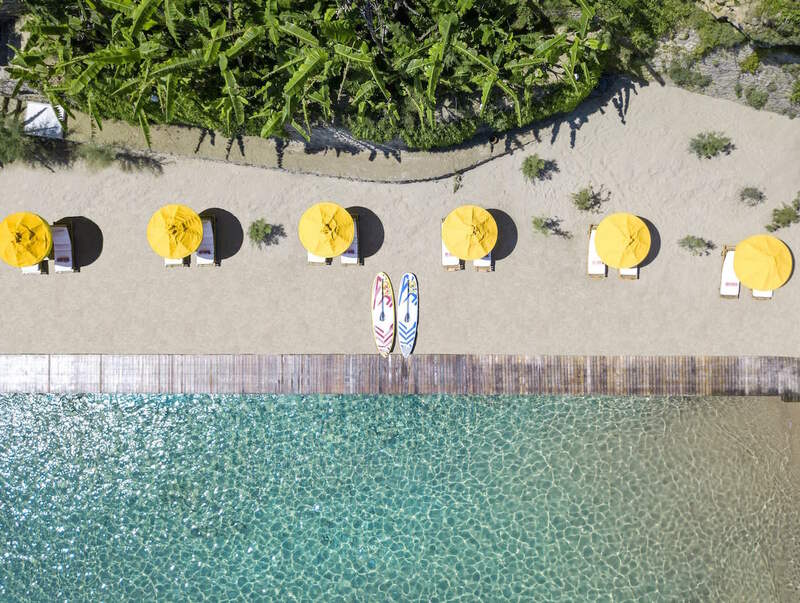 One of the best beaches in the world (as chosen by Condé Nast Traveler) awaits you only 20 minutes away from your villa by private speedboat or motor yacht. A succession of caves reflecting the striking deep azure color of the sea, the Blue Caves invite you to admire their wild beauty and dive in their marvelous waters. Visit Marathonisi Island, home to the endangered species Caretta-Caretta, and swim side by side with these beautiful creatures. Protected by the International Union for the Conservation of Nature, an absolute must-see is only 20 minutes away from your villa by private speedboat or motor yacht. Under the protection of the National Marine Park, Dafni beach with its untouched beauty is one of the most important turtle nesting beaches in Greece. Ideal for those looking for a secluded spot to relax and swim. Treat yourself to a private cruise with our private speedboat, motor yacht or sailing yacht. 30 minutes is all you need to reach Kefallonia, the biggest island of the Ionian Sea. Astonishing views of the capital of Zakynthos and other parts of the island, the Castle and the church of Virgin Mary of Chrysopigi, along with the traditional architecture and aristocratic allure, will make Bochali one of your favourite spots on the island. Porto Zante extends a gracious welcome to families with children. At the Kids' Club of the resort our little guests can choose from a selection of toys and games, or participate in one of the kids' entertainment sessions with fun activities and face painting. The Kids' Club also includes the Kids' Corner, the resort's beautiful playground. A day at the water park (200 meters from your villa) will be dedicated to playing with water-ejecting toys, sliding down the water slides, exploring the water jungle and climbing on a pirate ship. Our guided excursions to the Turtle Island (Marathonisi) will bring the children in contact with the unique Caretta- Caretta turtles. The kids will learn about the creature’s habitat and be sensitized to the environmental threats the turtles are facing. Non-motorized water sports, such as sea-cycling and canoeing are ideal for our little guests. Various beach and pool toys are also provided. Snorkeling is also popular among children, as it allows them to explore the rich underwater world of Zakynthos. From mini-golf and table tennis to pony riding in a farm and cycling in the National Marine Park, the options for fun and exercise are all tempting. The resort also features the Kids’ Corner, our cute playground. Surprise gifts, specially decorated rooms & villas, baby cots, special Kids’ Menu created by our Executive Chef, dining high chairs, babysitting, kids’ entertainment by our experienced staff. Before going to bed in their specially decorated rooms, our little guests can enjoy a movie from our library or a fun board-game. 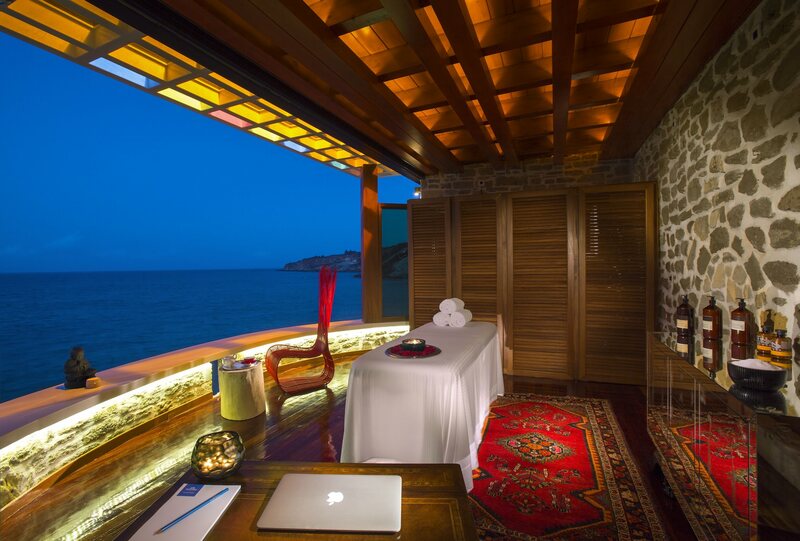 Escape to Europe’s most private hideaway and savor our discreet luxury services. Indulge in the warm summer sun on the resort’s secluded private beach, a chilled glass of champagne or a refreshing cocktail in hand. An exquisite dining experience under the starlit sky, in the ultimate privacy of your luxury beach villa, or on a secluded spot of our private beach, surrounded by a romantic candlelit atmosphere. Experience deep rejuvenation and replenishment with a selection of over 20 spa treatments, all in the ultimate privacy and comfort of your luxury villa, or let us pamper you in our Private Waterfront Spa. Relax your body and mind along with your partner, through a flowing sequence of easy to perform asanas (postures). Embark on a romantic private cruise to the unique Turtle Island (Marathonisi) or the magnificent Blue Caves. Enjoy your most intimate moments surrounded by a spectacular scenery and crystal-clear waters. The private yacht or speed boat departs from your villa’s beach. Away from prying eyes, in ultimate privacy, your specially decorated beachfront villa will be the luxurious background of your life’s most important celebration. A selection of fitness activities, all tailored to your requirements. Exercise in the resort Gym with our cutting edge fitness equipment which includes, among others, Technogym treadmill, Technogym electronic bicycle, Technogym elliptical machine, Technogym Plurima multistation, Technogym 4-uses bench, Swiss ball, medicine ball, foam roller and dumbbells. Revitalise and relax on the water’s edge. Through a sequence of calming asanas (postures), and with the assistance of our experienced instructor, you will have the opportunity to reach deep relaxation and release all body tension. Sessions can be attended by everybody, irrespective of their fitness level. Tailored to your needs, a personal training session in the privacy of your villa will keep you fit and rejuvenated during your vacation. A skilled personal trainer will customize the exercises to your specific strengths and needs. Our guests have the privilege of complimentary access to the nearby Tennis Club. Ride through the forest or along the beach, surrounded by the nature and stunning scenery of Zakynthos. Children can ride ponies and get in touch with this noble sport. Explore Zakynthos by a bicycle delivered to your villa. From a bike ride in the National Marine Park, to one to the mountain top Atheras, Zakynthos is ideal for cyclists of all levels. Immerse yourself in the unique Greek cultural tradition. An imposing mystic bell tower that belongs to one of the few Greek churches with Gothic elements, welcomes visitors to a village full of beautiful stone houses and trails through the forest. Situated in the capital of Zakynthos (7km from Porto Zante), the magnificent church and monastery of St. Dionisios feature important works of Byzantine Art. A major attraction for many visitors is also the 3-day celebration on August 24th. Visitors of the Byzantine Museum have the opportunity to mentally reconstruct the old capital of Zakynthos, through a number of works of art, dated back even to the 15th century. Don’t miss the museum of Dionisios Solomos, the famous poet who wrote the Greek National Anthem. Visitors have access to a large collection of the poet’s personal belongings and manuscripts, as well as a well-stocked library and a rich collection of portraits of eminent Zakynthians. Our private speedboat will take you to Peloponnese, from where our chauffeur will drive you to the birthplace of the Olympic Games in just 1 hour. An important archaeological site and sanctuary of ancient Greece, ancient Olympia features, among others, the temples of Zeus and Hera and the site where the Olympic Flame of the modern-day Olympic Games is lit.